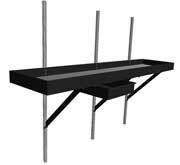 The Gardener Greenhouse is a hobby greenhouse that provides significant growing room for a variety of applications. The aluminum frame and UV-protected 10mm twinwall polycarbonate covering provide weather-tested strength and enduring plant protection. The four roof windows (six on the 16' and 19' lengths) offer plenty of airflow and are a helpful cooling option during the heat of the day. 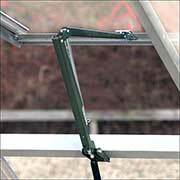 This optional all-steel Base Kit works with the Juliana Gardener Greenhouse. It ensures a stable structure and includes all required fittings.